Affordability, easy accessibility and highly intoxicating – these are the top three traits that are driving the increased abuse of highly dangerous, intoxicating and illegal drugs in what is becoming the ‘cheap’ drug industry in Zimbabwe. Early each morning , a group of youths gather at street corners across the high density suburbs in Zimbabwe’s Harare, Bulawayo and other small towns to share and abuse drugs. This has become part of what they call ‘ghetto style’ and those who take in the highly intoxicating drugs are seen by their peers as ‘cool’. James Nyika, also known as ‘Jimalo’ in the local Budiriro suburb of Harare revealed that drug abuse had become part and parcel of their ghetto life and culture. Most of these youths are already drug addicts and it is now difficult for them pull-out. “I can’t leave without smoking one or two in the morning (Dagga). It really makes my day and I feel good after smoking,” explained Jimalo. In an effort to get high there has been a countrywide increase in the experimental abuse of various drugs and substances. 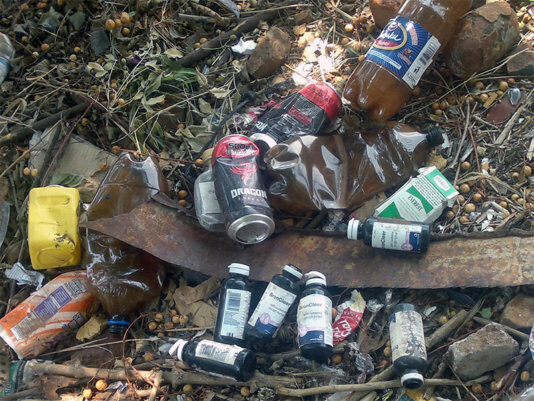 Hard drugs such as Cannabis (‘Marijuana’/ ‘Dagga’) and ‘small time’ drugs which include cough mixtures like Broncleer, popularly known as ‘Bronco’ and Histalix syrup, Psychiatric pills and caffeinated energy drinks are doing the rounds on the streets and in neighbourhood hotpots. Several factors have been blamed for the scourge of drug abuse and chief among them is the high unemployment rate- stemming from the economic slouch in the country. This lack of jobs and other positive activities to partake in for self development, especially for young people, has led to the indulgence in drugs as a way of whiling up time and forgetting the frustrations of a life of poverty. While young people are expected to wake up and go to school or work, these youths now including girls, abuse drugs in order to get into their escapist fantasies. Apart from the inability to secure jobs, the popularity of ‘cheap’ drugs has been spurred on by the immense peer pressure that makes youths want to belong to the ‘cool’ crowd. In addition to the peer pressure, the lifestyle portrayed by some Zim Dancehall icons which glorifies the use of intoxicating drugs and substances is negatively influencing youth perceptions of drug abuse as being the ‘in thing’ (Zim Dancehall is a popular Zimbabwean music genre with roots in the Jamaican tradition of Reggae and Ragga genres). An investigation by fairplanet reveals that Cannabis (Marijuana/local name ‘Mbanje’/ ‘Dagga’) is the most commonly used cheap drug as it is grown locally or sometimes easily smuggled into the country from neighbouring Mozambique, Malawi and South Africa. “Large quantities like a paper bag go for US$50, but you can get small packets of Mbanje (Cannabis) which can cost as little as 5 Rands or US$0.50,” said Tawanda* Chikukwa, a regular buyer. “Mbanje gets me really high. Whenever I smoke a joint I spend my day happy, plus I am not afraid to do anything, it gives me the courage to do many things that I usually can’t do when I am sober,” added Chikukwa. There is a growing concern over the prevalence of prescription drug abuse in Zimbabwe. The first kind is that of cough syrups with Broncleer, ‘Bronco’/ ‘Ngoma’ being the most abused. Bronco is used as a relaxation drug and is heavily peddled in areas such as Makokoba in Bulawayo and Chitungwiza, a town in the Harare Provincial area. “It’s easy to get ‘Bronco’, you can get it from a pharmacy or even in the hood as most of the dealers bring it in from South Africa. For a full 100ml bottle you can pay about US$4 or US$3 depending on the place you go to, then half a bottle is about US$2.50 and a quarter of a bottle is US$1.50,” said Charles* Mushonga, a Polytechnic student who is a user of the syrup. For you to get really drunk you have to drink the whole bottle, and one has to make sure that it doesn’t come into contact with the teeth because it makes them rot easily and fast. Another bad thing is that Bronco makes you lose your appetite but gives you a desire to eat sweet things like lollipops. It also affects your ability to pass stool properly,” explained Chikukwa. The second kind of prescription drug abuse is that of anti-pain medication such as Morphine and Pethadine. In addition to these, there has been a rise in the abuse of mental health pills such as Chlorpromazine or ‘Maragado’ (street name) whose effect can last upto 12 hours. “For me ‘Maragado’ does the trick, it knocks me out for hours and its very good for my pocket because I can get 12 pills for just US$1. If I want a normal high I take only two to four pills that make me drunk but awake,” said Marshall Moyo, a form three student who admitted to taking the drug after being introduced to it by his friends at school. Many more drugs are erupting and finding their way into the hands of eager addicts who are willing to experiment with all sorts of substances to get their daily fix. Some are even walking into supermarkets and ‘innocently’ purchasing caffeinated energy drinks such as Dragon, Power Play, Monster which cost anything close to US$2 or less and mixing them with spirit liquors to feed their habits. In Bulawayo, a South African drug called Nyaope or ‘Whoonga’ is slowly trickling in. This highly addictive white powder is a mixture of antiretroviral drugs, Mandrax and rat poison. Some of the Nyaope versions infuse milk powder, pool cleaner and bicarbonate of soda and are mixed with Cannabis, Heroin or Chlorine. What all these drugs and substances have in common is their potential to cause permanent mental as well as physical damage to the addicts. The Ministry of Health and Child Care’s Department of Mental Health indicates that from 2013 more than 135 drug-induced psychosis admissions were recorded at Harare Hospital with 865 outpatients being documented. With drug addiction comes Psychosis which is an experience of mental disorders like Hallucinations, seeing distorted mental pictures and a slowing down of reflexes. Many of the addicts are living a life of crime to support their drug life and this is further tarnishing the moral fabric of society. This growing cancer of drug abuse spells out a bleak future for generations that are still to come. However, a light can be seen at the end of the tunnel if the country amps up on the provision of anti-drug awareness campaigns and several effectively functioning rehabilitation centres for the increasing number of addicts. A Zimbabwe Republic Police (ZRP) report that was produced in line with the 2014 International Day against Drug Abuse and Illicit Drug Trafficking revealed that Harare had the highest rate of drug abuse in the country between 2013 and 2014 with over 1000 cases having been recorded monthly. Although there has been rampant abuse of drugs by both adults and youths, research by the Anti- Drug Abuse Association of Zimbabwe indicates that youths are the most vulnerable group in society.